To be honest its funny how we now love the glass box. Put maybe to make it more livelier is for it to be over the newsroom or random cubicles or looking down them from higher floors where you can see. But with its placement it likely won’t happen. I'm not sure anyone 'loves' it. Not even the Sky team. It's a failed project. The key now is to make it work. The studio floor needs to change. Possibly a dark gloss finish. I'd also suggest a more interesting desk structure. The final touch is to invest HEAVILY in lighting design for the atrium area outside. It would not impact on working environments, as it's just the stairway. I always thought a video ribbon should have been on the adjacent balconies or railings across from the cube. The glass box changes following the launch of the new automation did make it better, but I still wouldn't go as far as saying that I love it. I can tolerate it now and don't have real problems with it like I did at the start, but it's still not a patch on the old Sky News Centre which in it's final few months looked the best it ever did. The biggest problem with the glass box is it's designed to look good, almost like a trophy for Sky to show off, rather than being designed to be a proper studio and that is where all the problems come from. - The mixed big screen/green screen studio, which looks naff when they just plonk a big image on each screen and drag some sofas in from elsewhere. By 2010 the spaces they had at the Sky News Centre may have changed slightly (switch around of desks by the newswall and they stopped using the balcony I think) but they then gained the current Wesminster set and the Gherkin! 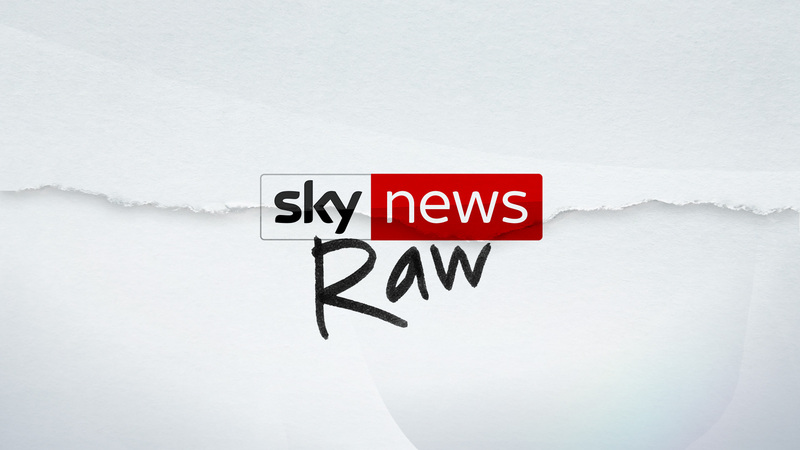 Information on Sky News Raw released, plus a logo. It will be on channel 523 on Sky. Wouldn’t be surprised to see something more permanent to replace the patio chairs at some point. I still think the glass box looks pretty decent - maybe some of the beige walls in the distance would look better in a bolder colour (or white) but it tends to look good on Kay’s show and when Jayne Secker and Colin Brazier are on. My issue is still with everything else - particularly the graphics and music. Every other news broadcaster in the UK has gone back to non-flashy straight news sat behind a desk. Everything’s a bit dull. Sky could really stand out now if they wanted by rethinking how they present things and modernising the look and sound of the channel. And I wish they’d choose a slightly less gharish colour scheme. I do think that had Sky's 2005 look been introduced now, it would have been received far more warmly than it was back then. Whilst Sky's journalism is, IMO, better than ever (and that is, of course, the most important bit). I do find the current look and feel of the channel so very dull. Let's face it, a glass box overlooking a corridor and a semi-virtual studio don't exactly set the world on fire, do they? I'd actually love to see a UK broadcaster be so bold as to ditch chairs completely, as the Dutch NOS did in 2012. I reckon that whomever does could really set themselves apart from the competition. Sky News are publicing a special programme called 'The Future of News' at 19:00 tonight to mark their 30th birthday. Not a lot really, infact I found the programme quite tedious. It was basically some heavyweights from different aspects of the news business defending it. Have they tweaked the Milbank studio recently? It looked a lot fresher tonight than it usually does.